No matter what current market conditions are, one of the biggest challenges for an investor is finding stocks that fit their investment preferences at any given time. The market ebbs and flows from high to low extremes, and those shifting conditions mean that investing strategies may offer up more opportunities in one environment, and fewer good choices in another. Value investing is a great example; when the market has been declining for an extended period of time, or even in the early stages of recovery, finding undervalued stocks isn’t that hard to do. Even a short drawdown in the market, such as what we saw in the last quarter of 2018 is often a good opportunity to start finding more and more attractive value-oriented opportunities. The longer a bull market lasts, however, the harder that becomes, as more and more stocks are found at or near historical highs, and at inflated prices relative to the stock’s underlying fundamentals. As a value-oriented investor, I’ve learned that just because there may be fewer bargains available in the late stages of a bull market, it doesn’t mean that I have to change my philosophy. Let’s face it – even with its drop to near-bear market levels late last year, the stock remains very extended, with the S&P 500 pushing near to the all-time highs it set in September of last year. That means that this while you don’t want to close yourself off to truly compelling opportunities, you do need to be careful; that means being a more cautious and deliberate buyer. The core fundamental and value criteria you see me highlight in this space for every trade I consider becomes even more important, because they help me maintain my discipline and avoid jumping on the market’s bullish bandwagon at the dangerous, “irrational exuberance” stage. I’m not sure we are at that point yet, but we also aren’t very far off from it, and so my conservative approach continues to help me sleep well at night. International Paper (IP) is a stock that has seen an impressive increase in price since the current bull market started in early 2009 was only around $4 per share, and as of now it is trading a little above $47 per share. At first blush, that might make the stock sound more like it should be overvalued. The company has a strong fundamental profile, however, and the growth of its business over the same period lends to strong argument for the stock’s higher price. Not only that, since January of 2018, the stock is actually down nearly 15% from its peak at that point at around $67. Working off of standard valuation measurement suggests there is a pretty solid argument to be made that at its current levels, IP looks like a pretty attractive value play right now. Whether or not this is a good time to buy the stock’s bargain proposition is a more complicated question. As you’ll see, most of the company’s fundamentals are solid, but there are a couple of red flags that are worth noting and thinking carefully about. The other reality is that global market conditions, including trade concerns related to tariffs, aren’t really stellar right now. Fears about a slowing global economy persist, and as one analyst I saw yesterday pointed out, “trade progress isn’t a trade deal.” Trade concerns between the U.S. and China aren’t going to go away until some kind of actual deal is made, and even assuming that happens, there are still America’s other trading partners, including Europe to consider. This week the Trump administration threatened a new round of tariffs against the European Union in response to news that its officials have been negotiating with Airbus, giving that company an opportunity to profit by swiping business from pending, but currently on hold contracts with Boeing (BA). A lot of multinational U.S. companies have started to show signs that extended tariffs and trade pressures have started to affect their business in negative ways, and IP is a company that does business throughout the world, including China and Europe. Do trade pressures, and a few fundamental holes means IP is a stock to stay away from? I’ll let you decide. International Paper Company is a paper and packaging company with primary markets and manufacturing operations in North America, Europe, Latin America, Russia, Asia, Africa and the Middle East. The Company’s segments include Industrial Packaging, Global Cellulose Fibers, Printing Papers and Consumer Packaging. The Company is a manufacturer of containerboard in the United States. Its products include linerboard, medium, whitetop, recycled linerboard, recycled medium and saturating kraft. The Company’s cellulose fibers product portfolio includes fluff, market and specialty pulps. The Company is a producer of printing and writing papers. The products in Printing Papers segment include uncoated papers. The Company is a producer of solid bleached sulfate board. As of December 31, 2016, the Company operated 29 pulp, paper and packaging mills, 170 converting and packaging plants, 16 recycling plants and three bag facilities in the United States. IP’s current market cap is $18.9 billion. Earnings and Sales Growth: Over the last twelve months, earnings grew almost 30% while revenue growth was modest, increasing only a little over 4%. Growing earnings faster than sales is difficult to do, and generally isn’t sustainable in the long-term; but it is also a positive mark of management’s ability to maximize business operations. In the last last quarter, earnings increased almost 6%, with sales mostly flat but positive, showing an increase of 0.85%. One red flag that shouldn’t be ignored is the company’s margin profile, which is showing signs of deterioration. In the last twelve months, Net Income was 8.6% of Revenues, while in the last quarter, it was 5.31%. Both of these numbers have also declined appreciably since the middle of last year, which to me is an indication of narrowing profitability. Free Cash Flow: IP’s free cash flow is very healthy, at $1.57 billion. This is a significant increase from the middle of last year, when free cash flow was a far more modest $361 million. While this is encouraging, it doesn’t completely offset the warning sign that I think is being seen right now from the narrowing margin profile. Debt to Equity: IP has a debt/equity ratio of 1.36, implying they are fairly highly leveraged. This is pretty normal for the Containers & Packaging industry, so in an of itself this isn’t a major concern; however, the company’s balance sheet shows that IP’s liquidity has been deteriorating. In mid-2018, cash and liquid assets were more than $1.1 billion, but that number has eroded to $589 in the last quarter. By comparison, the company has a little over $10 billion in long-term debt. Dividend: IP pays an annual dividend of $2.00 per share, which translates to a yield of about 4.24% at the stock’s current price. Price/Book Ratio: there are a lot of ways to measure how much a stock should be worth; but one of the simplest methods that I like uses the stock’s Book Value, which for IP is $18.23 and translates to a Price/Book ratio of 2.58 at the stock’s current price. Their historical average Price/Book ratio is 4.13, which provides a strong basis for the stock’s long-term upside. A move to par with the average would put the stock above $75 per share, more than 60% higher than the stock’s current price and even above its all-time high around $67. Current Price Action/Trends and Pivots: The diagonal red line traces the stock’s downward trend from January 2018 to the end of the year, and provides the reference for calculating the Fibonacci retracement levels indicated by the horizontal red lines on the right side of the chart. The stock has rebounded from that low, around $37.50 to its current price around $47, which marks an increase of more than 25% since that time; however since February the stock has consolidated in a fairly narrow range between resistance at around $48 and support around $45. The 38.2% retracement line is sitting right around $49 and appears to be acting as the cap that the market has used to define the stock’s resistance levels, which means that the stock would need to break higher to at least $49.50 before it would be likely to confirm and continue the upward trend that started after Christmas. 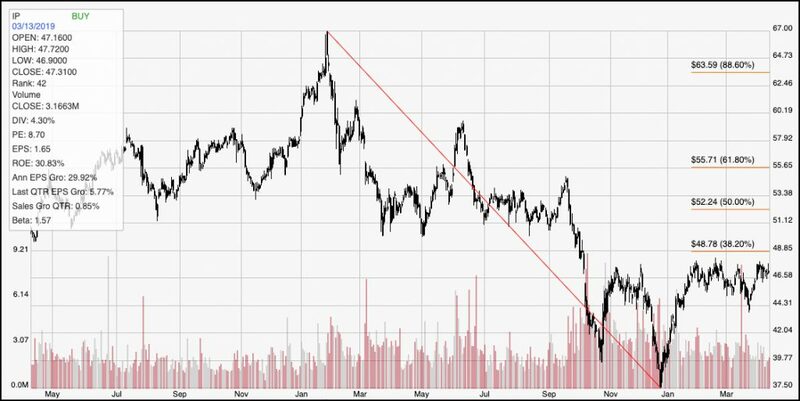 A break below $45 could see the stock quickly drop to as low as around $39, or possibly even retest the trend low at $37.50. Near-term Keys: If you don’t mind working with a little volatility over time, and can tolerate a potential swing lower, the value proposition for the stock offers a great long-term opportunity with a very attractive dividend yield to draw from right now. While the value proposition is attractive, I would prefer to see some improvement in IP’s liquidity and Net Income numbers before I take a long-term position in IP seriously. If you prefer to work with shorter trading periods and strategies like swing or momentum trading, look for a push above $49.50 before taking a long position in the stock or working with call options. A drop below the stock’s current support around $45 could mark an interesting signal to short the stock or work with put options, since the stock isn’t likely in that case to find new, significant support before reaching the $39 level marked by its October 2018 pivot low price.